Many different jobs require certain activities that may cause injury to your shoulder or rotator cuff. Painters, construction workers, warehouse employees, or anyone else that regularly engages in overhead job duties or heavy lifting may begin to experience pain due to damage to the muscles and tendons around the shoulder joint. Additionally, these injuries may occur due to an accident that causes a tear in your shoulder. Shoulder and rotator cuff injuries can be severe and may prevent you from returning to work. Anyone who sustained a job-related injury should consult with the Law Office of Kenneth P. Carp at 636-947-3600 as soon as possible. Often, in order to recover from this type of injury, an individual requires intensive physical therapy and often surgery to repair the damage to the soft tissue. Surgical patients often have their shoulder and arm immobilized for weeks following the procedures and may take months to return to normal range of motion or strength. During this time, benefits from your state workers’ compensation program can provide valuable assistance including compensation for lost wages, medical treatment, payment for temporary disability, and more. If you have sustained a shoulder or rotator cuff injury or require surgery, you may be facing costly medical treatment and significant recovery time before you can return to work. If your injury occurred during a job-related task, you deserve to receive the full benefits to which you are entitled under workers’ compensation law. 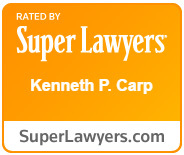 Workers’ compensation attorney Kenneth P. Carp has extensive knowledge of state workers’ comp laws and has helped numerous injured workers nationwide. Please do not hesitate to call 636-947-3600 to discuss your case with the Law Office of Kenneth P. Carp today.